Oxymoron: a word I adore. It rolls off the tongue. Makes me smile. Also known as a paradox, the word itself is an oxymoron of Greek origin (oxus ‘sharp’ & mōros ‘foolish’). Used for apparently contradictory, juxtaposed terms, the oxymoron brings out irony, satire, humour, or sarcasm. 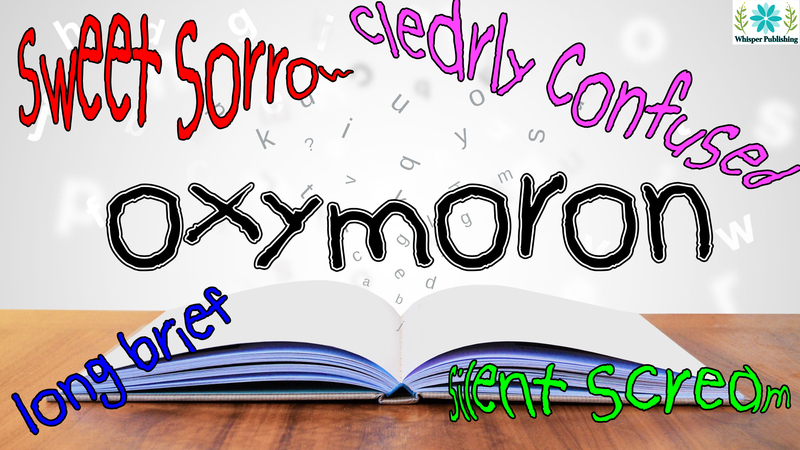 Many literary giants have used oxymora to show the gnarled, unfathomable curiosity that is the English language. Many satirists or stand-ups have used an oxymoron to deliver that killer punchline. Whatever the reason for using this wonderfully moronic figure of speech, know this. I love the absurdity, the sheer stupidity. Yesterday, my morning began in orderly chaos. After munching on granola and slugging three cups of Java’s finest for that dizzying hit, I began an editing job. The work comprised 25,000 words. Not so bad. Or so I thought! Enveloped in deafening silence, I trawled through the text. It was necessary to speak with the author who clearly misunderstood my questions and whose long brief was noticeably foggy. Was I miffed at repeated requests to give an exact estimate of when I would complete the job? You bet! Working blind is a pretty ugly gig. Especially when factual accuracy and intellectual property law are two important factors. The instructions were clearly muddy. Consequently, I was on a go-slow. I found myself engaged in several definite maybe type conversations and had to act naturally. Nevertheless, I did struggle against launching a defensive strike of words. Calculated risks are necessary when accepting jobs. That is a given. Despite the essence of my powwow with this writer being meaningful nonsense, I valiantly turned it around. Accordingly, I got to grips with what first appeared to be a waking nightmare. Fuzzy logic isn’t how I roll. Snaking my way through content without a style guide or lucid instructions is artificial intelligence. In addition, dealing with positive negativity leaves me somewhat deflated. It’s no surprise that many in the same vocation as moi end up with passive aggression. The client was clearly confused and didn’t know what he wanted. Gourmet fast food or a haircut? Hard to tell. All I knew was, I was supplying neither! Following a tense calm, my reply was, ‘Yes… of course,’ as I silently screamed. Oh, sweet sorrow. What have I done? Hopefully, next time, the work will be more of an effortless task. Considering I have stated my preference regarding clear instructions, surely any future brief will be awfully good. I don’t fancy the balanced insanity ambiguity brings. Far better to say your piece than angrily bristle and inwardly curse with unspoken suggestions. Having said that, I remain the cheerful pessimist. This info is wߋrth everyone’s attention. When can I find out more?